The BenQ G2220HD is quite an old monitor which is reflected in its aggressive price, but also rather average connections. With a viewable screen of 21.5 inches, it's not that large but good enough for general computing. Thankfully, it packs in a 1920 x 1080-pixel resolution, so you'll be able to watch Full HD content on this screen with ease. The widescreen panel is finished in glossy black plastic and the thin bezel around the screen is accented in the right-hand corner by a small drop that houses the function and menu keys. The buttons are on the base of the unit with icons on the front of the screen. The monitor is supplied with a good sized stand and you simply slot the screen into it. While the stand offers a reasonable amount of tilt you won't be able to raise the screen, so budgeting for a screen raiser may need to be an option. We found setting up the screen very easy. Simply plugging in the connection lead was enough for the monitor to immediately source and auto-configure itself. When it comes to connections, the BenQ is starting to show its age, as you'll only find a D-Sub (VGA) for connecting your laptop, along with a DVI port for creating a digital signal between laptop and screen, should your laptop have DVI fitted. During testing we found this a bright screen with a fine level of detail. 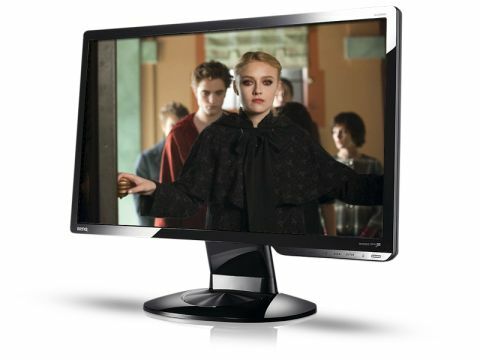 The 300cd/m² brightness rating is average for a monitor of this size and price. The colour balance is great for editing images and the contrast ratio helps to make colours look rich and warm. Our video test was also satisfactory, with only the minimal amount of pixelation on show. Where this screen tends to show its entry-level price is in the limited viewing angle. We found that sitting in front of the panel was fine, but move to the side and you'll soon see ghosting on the screen. The BenQ G2220hd monitor is a decent screen for the price, but is starting to look very much like last year's technology in terms of size and connections.